The Boxing Truth®: Possible Jr. Featherweight Box Off? Bring It On! In recent years the 122lb. Jr. Featherweight division has had two fighters, who have been the division’s central figures. The unified WBA/WBO Jr. Featherweight world champion Guillermo Rigondeaux and WBC champion Leo Santa Cruz. Rigondeaux, undefeated in fifteen professional fights is widely considered the number one fighter in the division. An argument can be made that if Rigondeaux is the number one fighter in the division, Leo Santa Cruz could be considered 1-A as Santa Cruz, undefeated in thirty professional fights has won world titles in two different weight divisions. While some might talk of a potential unification bout between Rigondeaux and Santa Cruz to determine who is the best fighter at 122lbs., there is another fighter who has emerged as a player in the division. The undefeated IBF world champion Carl Frampton. Frampton, a former European and Commonwealth Jr. Featherweight champion won the IBF world championship in September of last year in scoring a dominant twelve round unanimous decision in his rematch with Kiko Martinez. Frampton’s second victory over Martinez not only earned him a world title, but also established him as a player in the division. Frampton’s first title defense came on February 28th against top contender and IBF mandatory challenger Chris Avalos at the Odyssey Arena in Belfast, Northern Ireland. The champion used solid lateral movement and hand speed to consistently beat Avalos to the punch. What impressed me about Frampton’s performance in addition to how well he used his lateral movement was the accuracy of his offense. Frampton was able to land crisp combinations on the challenger and more or less dictated how the fight was fought from the opening bell. Frampton’s systematic attack gradually took a toll on Avalos and ultimately resulted in a fifth round stoppage for the champion. Simply put it was a dominant performance by a world champion in his first title defense. The win over Avalos has potentially set the stage for some interesting fights in the Jr. Featherweight division. A scenario that this observer has thought of since Frampton’s stoppage of Avalos could result in the potential for full unification of the Jr. Featherweight division. In addition to Rigondeaux, Santa Cruz, and Frampton there is another fighter who like them is undefeated. Scott Quigg. Quigg is undefeated in thirty-two professional fights and currently holds interim/regular champion status in the WBA’s Jr. Featherweight ratings. Although this would theoretically give Quigg an opportunity to challenge Guillermo Rigondeaux for his unified world title, a fight that has gained significant interest is a potential battle between Quigg and Frampton. A fight between Frampton, who is now undefeated in twenty professional fights and who has stopped five of his last seven opponents inside the distance up against Quigg, who has stopped three of his last four opponents is certainly intriguing. 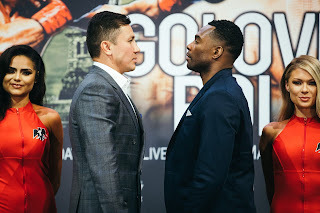 A fight between the two would definitely be a draw in the United Kingdom and would also be a fight that would draw the interest of Boxing fans here in the United States. Quigg, who last fought in November of last year scoring a twelve round unanimous decision over Hidenori Otake has scored twenty-two knockouts in his thirty wins as a professional. In comparison to Quigg, Frampton has scored fourteen knockouts in his twenty career wins. Both fighters have registered career knockout percentages of nearly 70% and a fight between the two would be a battle between two highly skilled fighters who can box and have shown the ability to end fights early. What could result in full unification of the Jr. Featherweight division is if Frampton, Quigg, Rigondeaux, and Santa Cruz were to take part in what would amount to be a two fight box off where the winners would face each other for the undisputed Jr. Featherweight world championship. It is important to remember that a fight between Frampton and Quigg has not been signed, nor has a potential fight between Rigondeaux and Santa Cruz. This observer however, believes the possibility of the potential fights taking place is certainly realistic. If a box off involving the four were to take place it would bring arguably the four top fighters of the 122lb. Jr. Featherweight division together to determine an undisputed champion. It is something that would be a positive for the sport. Bring it on!